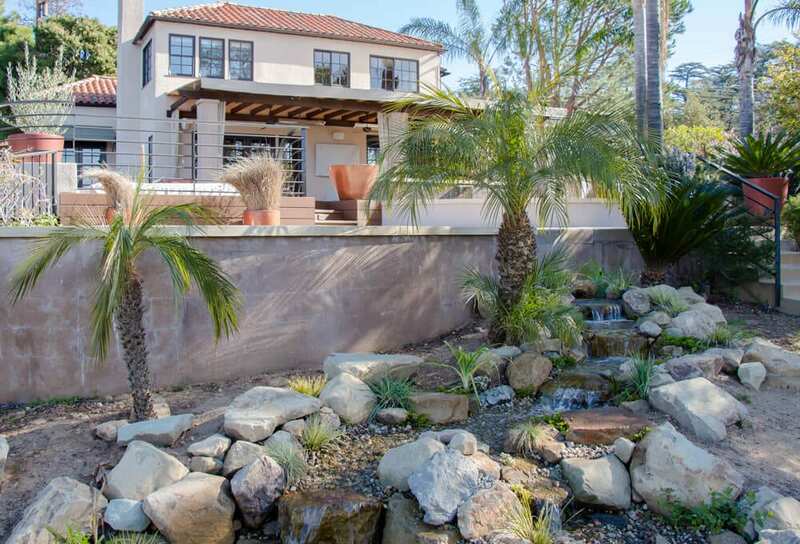 Our designers have years of experience designing hundreds of the most beautiful Pondless Waterfalls and Streams across Southern California! 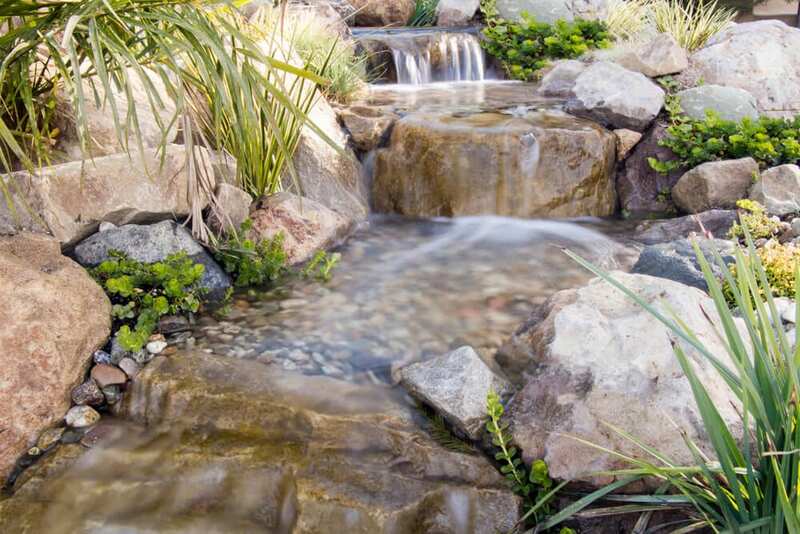 Ponds and waterfalls are wonderful additions to your yard or garden. The beauty of natural stones and plant life, coupled with the peaceful sounds of rushing water, immediately transport you back to nature without ever leaving your home. Installing one is a big project, however, and some people aren’t sure if it’s the right choice for their home. If you’re hesitant about installing a complete ecosystem in your yard, due to space or maintenance, a Pondless waterfall can be a great alternative to a full pond. Do they work for small spaces? Pondless waterfalls generally take up less room than a full pond, although large Pondless systems can be installed if desired. Custom shapes, sizes and features can be installed, depending on what you’re looking for. If you later decide to install a full pond, the system can be swapped out. Parents with young children won’t have to worry about them playing too close to the waterfall, because there’s no danger of falling in. Rocks are also very securely placed so that the more adventurous children can climb away without rocks slipping out of place. Where is the water stored? A Pondless waterfall features an underground basin that catches the water and sends it through a filter and back up to the waterfall again. This re-circulating stream gives the illusion that the water starts from atop the waterfall and comes down into the Earth. All the beauty of a waterfall is there, only without the pond and added maintenance. Pondless waterfalls are a lower maintenance alternative to a koi fish pond and eycosystem. 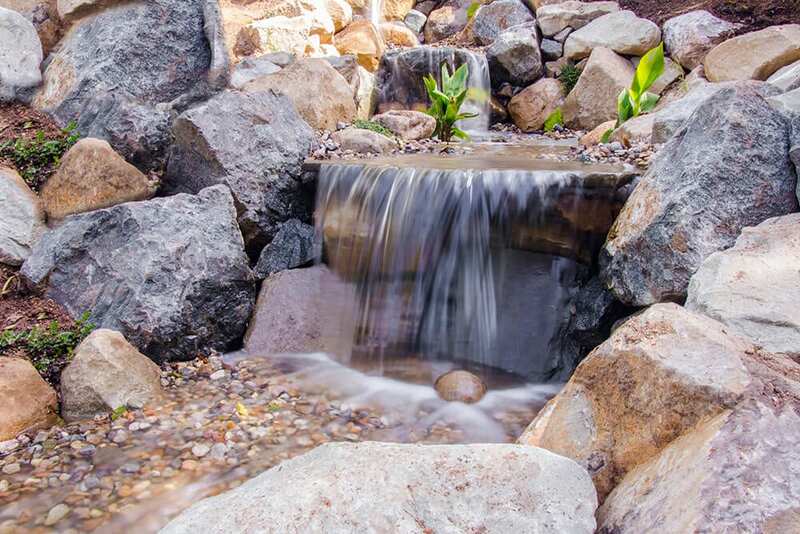 This can be a great choice for anyone who loves the idea of a waterfall in their backyard, but isn’t sure about installing a full pond. Ponds require maintenance and cleaning, which isn’t for everyone. Our installation team is second to none. Quality and efficiency are of the highest importance when it comes to all of our water feature installations. 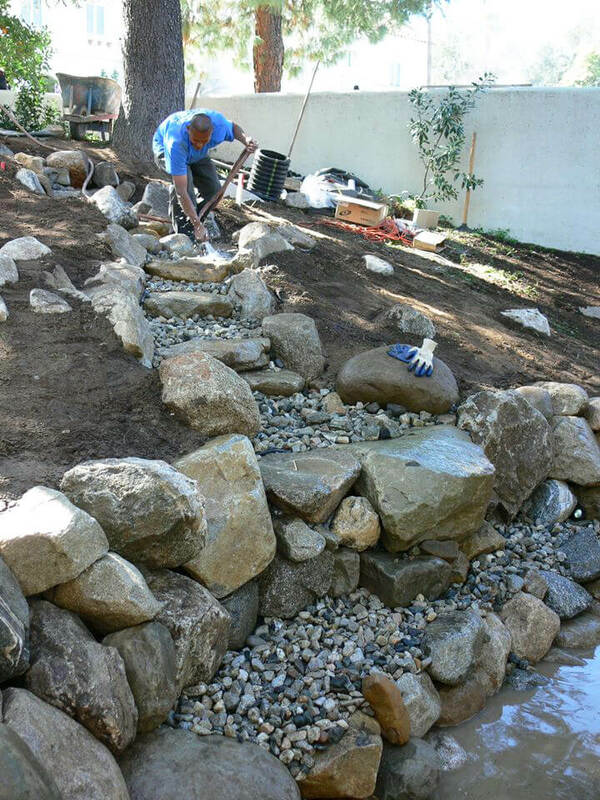 Our installers go through a rigorous training period, where they learn hands on how to build a pondless stream or waterfall from start to finish. Our jobs typically can be completed within just a few days, ensuring the homeowner is informed and confident every step of the way. To install a Pondless waterfall, a hole is dug and a pond basin is put in place. It’s filled with water, covered with a grille and then lined with gravel. A pump will push the water up through a nozzle behind the waterfall, sending it down the rocks and into the ground. The water is then collected back into the basin, filtered and sent right back up. It looks like there’s no pond at all, when in reality, it’s just beneath the ground and not visible. We specialize in professionally installing Pondless Waterfalls of all shapes and sizes! We have almost 20 years of experience installing water features. We are unparalleled in experience and knowledge in the art of installing the most beautiful, eco-friendly ponds and water features. 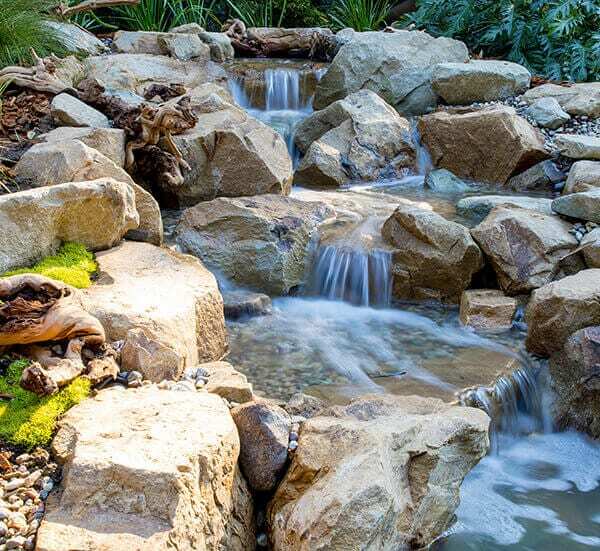 The hundreds of Pondless Waterfalls we have installed over the years, are designed to both look and function as closely to nature’s own as possible. This allows for it to become part of the natural landscape also, attracting birds, butterflies, and housing beautiful fish and plants. 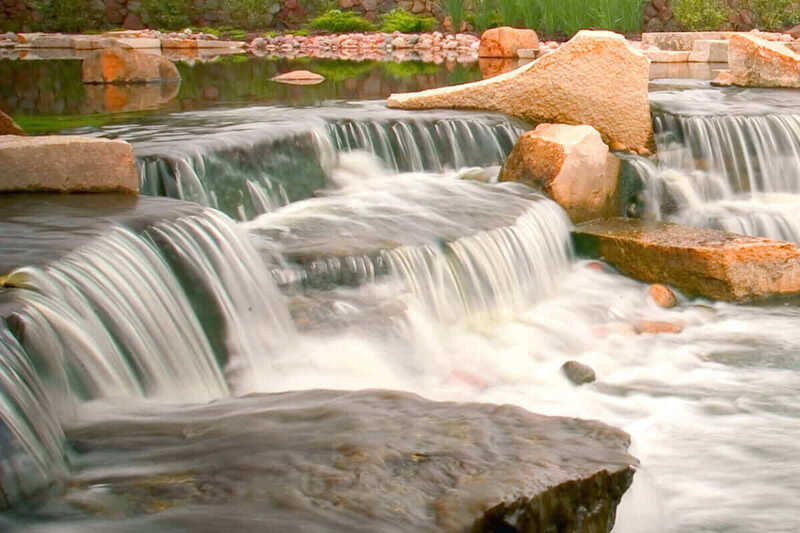 We are experts in Pond, Pondless Waterfall and Fountain repairs and reconstruction! 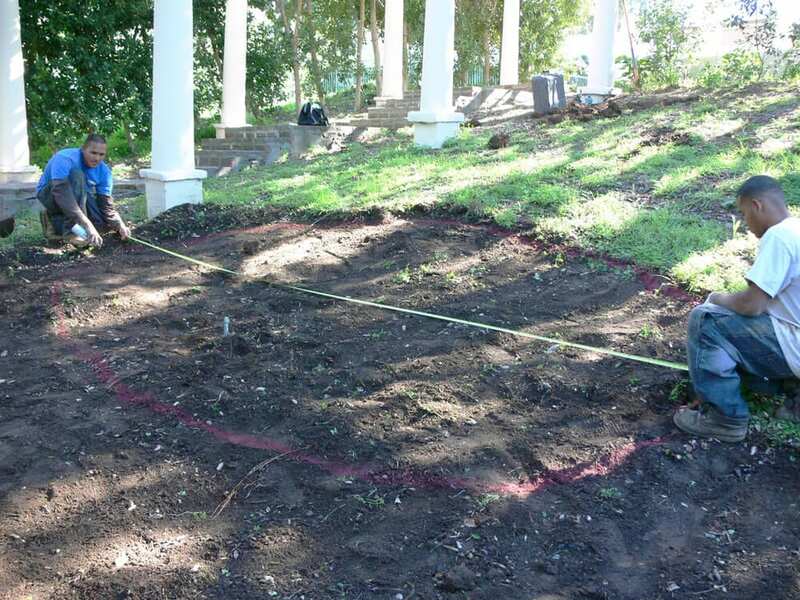 From finding and repairing those pesky leaks or completely reconstructing the entire pond, we have done it all. All of our ponds and Pondless waterfalls have a one-year warranty against any damage or repairs. Although our ponds are designed to be sturdy and a lifetime, sometimes a pump or liner issue may require our attention. We are happy to troubleshoot and answer any questions you have, to help get your pond up and running again! Dreaming of your own pondless water feature?